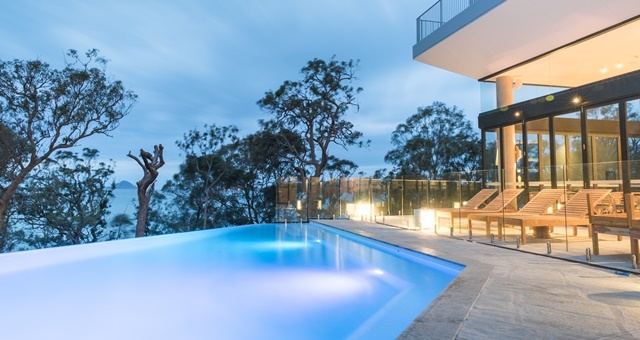 Luxury boutique accommodation brand Bannisters has opened its third NSW property in the form of a picturesque resort in Soldiers Point, near Port Stephens. Situated beachfront, Bannisters Port Stephens features 78 rooms – 50 of which offer panoramic ocean or rainforest views – four suites and a penthouse. Guests arrive and check-in via a two-storey loft-style lobby which opens onto an infinity pool and bar. Two dining establishments are on offer, including ‘Rick Stein by Bannisters’ – a lunch and dinner outlet with a finely curated menu put together by Rick Stein and Bannisters’ head chef Mitchell Turner. The menu features local king prawns, sand whiting, snapper and blue eye trevalla as well as Sydney-grown rock oysters. Rick Stein and his wife Sarah have collaborated with Brokenwood Wines’ chief winemaker Iain Riggs to blend a special wine exclusively for this restaurant. The second dining outlet, The Terrace Bar, offers a more casual environment serving delicacies including fish tacos, haloumi salad, grilled barramundi and Archie Rose gin and tonic cheesecake. Bannisters General Manager Peter Bacon said it was a natural progression to expand the Bannisters name to Port Stephens when the right site became available. Bannisters Port Stephens is now open and welcoming guests seeking a spring and summer getaway.